Bauhinia blakeana is really in the pea family instead of the orchid family. The flowers of the Hong Kong Orchid Tree are gorgeous just the same. With these large green heart shaped leaves and 4" purple flowers this brings a very tropical look to a landscape. 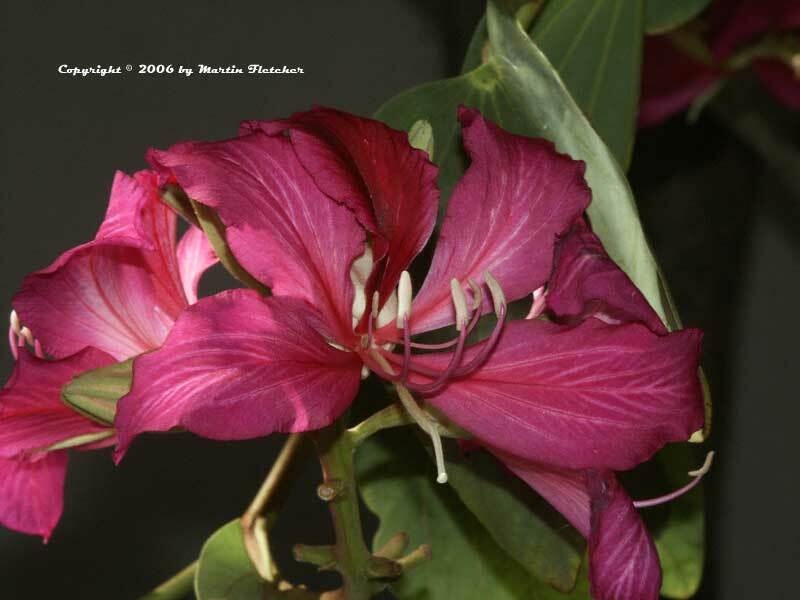 Hong Kong Orchid Trees are damaged severely when nights dip into the mid 20's. The Orchid tree is a fast growing tree to about 25 feet. It will bloom every month to 6 weeks so long as its requirements are being met. Regular water, well mulched soil, plenty of nutrients and warm weather make Bauhinia blakeana happy. Regular pruning is necessary or the Orchid Tree will break itself down with its own weight. Orchid trees often lose many of their leaves after a blooming cycle. Flowers and foliage of Bauhinia blakeana the Hong Kong Orchid Tree. High resolution photos are part of our garden image collection.